La Femme: what's up pussycat? Street fashion is going feline. Posted by la femme at 4:51 p.m.
haha...this is great. i spent a good minute or so trying to find the correlation between your entry title and the three photos. love the different takes on this top. good eye lady! they are all the same shirt, no? do you know where they have come from? i never notice things like this. good job. lola: I like the sound of that badge! So many people ask how I can afford to travel that I thought I should just post the answer where everyone can see it. susie: aw, mine would like you. cat party loves this post! you've been tagged...check my latest blog to see the food questionnaire I want you to answer! 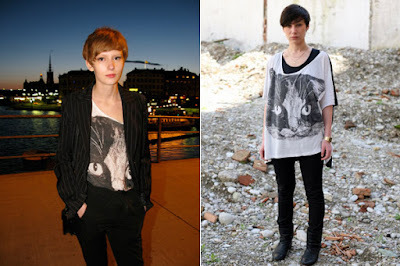 Cats seem to be everywhere at the moment...in terms of fashion. Teen Vogue did a piece of a models posing with cats recently!